NOAA's Deep Sea Coral Research and Technology Program was established under the authority of Section 408 of the Magnuson-Stevens Fishery Conservation and Management Act (MSA), as reauthorized in 2007. This legislation requires a biennial report to Congress and the public summarizing the steps taken by NOAA to identify, monitor, and protect deep-sea coral areas, including the Program's research activities and results. The Program consults with the nation's eight regional fishery management councils and collaborates on research with other federal agencies, international partners, and nongovernmental and academic scientists. The Program collaborates with other NOAA programs and offices, such as National Marine Sanctuaries, Ocean Exploration and Research, Fisheries Science Centers and Regional Offices, National Centers for Coastal Ocean Science, and National Centers for Environmental Information. These programs and offices support exploration, research, analysis, and management activities critical to understanding and managing deep-sea corals and other ocean resources. The Program actively works to leverage their expertise. This report describes the 2016 and 2017 research activities partially or fully funded by the Program to meet NOAA's mandate to identify, study, and monitor deep-sea coral areas. The report is supplemented with details of these activities: https://deepseacoraldata.noaa.gov/. The report also briefly describes progress during this period in MSA and other NOAA management actions that contribute to protecting deep-sea coral areas. A subset of deep-sea coral research activities funded and executed by NOAA programs and offices other than the Deep Sea Coral Research and Technology Program is briefly discussed, as these activities are providing data that will be analyzed by our Program. Citation: NOAA (2018). 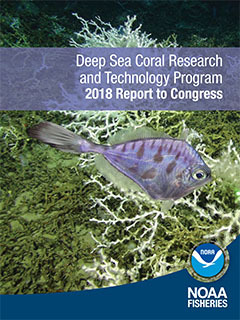 Deep Sea Coral Research and Technology Program 2018 Report to Congress. NOAA, Silver Spring, MD. 62pp.